Do the lights dim when your hydraulic elevator starts an up run? Can you hear the power lines slap against the pipes at this time? When an elevator motor starts it can pull anywhere from 6-10 times the normal current draw of the motor until the motor is up to speed. In many buildings the elevator motor is the single largest power consumption device in the building. It can put undue stress on the building incoming power, causing power surges and other unwanted electrical phenomena in your building. In addition, many motors have been blown over the years by one or more of the starter contacts welding together, causing what is known as a “single phase” condition. This is very hard on a motor, and usually ruins them in short order. 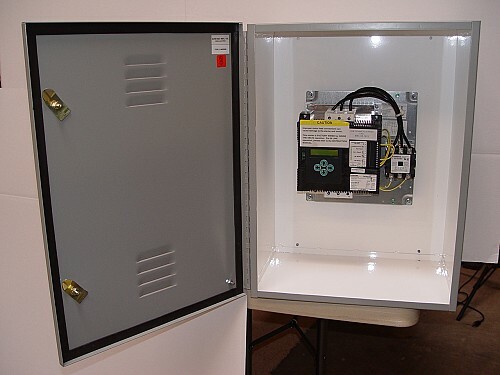 The across-the-line starter, which simply connects the building power to the elevator motor at start up, causing the aforementioned inrush of current until full speed is attained. The wye-delta starting arrangement requires a 6 or 12 lead motor, but starts the motor in a more gradual manner, in an attempt to mitigate the in-rushing current. The solid-state starter or “soft-start”, which can be used regardless of the number of leads on the motor. The modern solid-state starter virtually eliminates the dimming of lights and line slap by allowing the technician to program the maximum current draw upon startup of the motor. Additionally, there are no moving parts or contacts to weld causing a single phase condition, thus an added layer of protection for the expensive elevator pump motor. Our seasoned technicians will analyze your system upon request and determine if a solid-state starter makes sense for your particular installation. We will never try to sell you a product you do not need. Our policy is to treat your building as if it was our own investment, and our recommendations will reflect this attitude.